My Prana Box this month. I am not a luxury kind of woman. At least, I can really enjoy luxuries when they present themselves to me, but I don’t tend to seek them out or spend money on them. Part of that is because I run a tight ship, choosing freedom, passion and creativity over money – although I’m not suggesting that these things are in any way mutually exclusive either! It’s just the way the cookie has crumbled over the last few years for me. 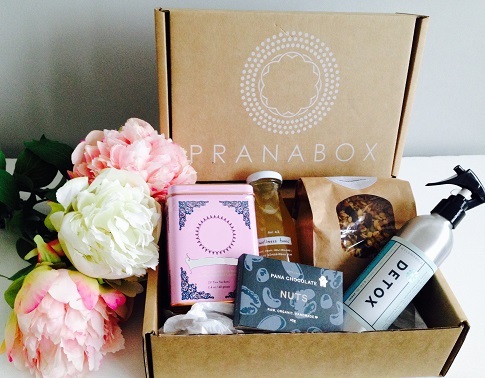 This week a box of luxury arrived on my doorstep courtesy of the new New Zealand company Prana Box. Every month, Prana Box is sending out it’s boxes of joy to subscribers up and down the country. You choose whether to receive a mini-Prana Box ($24.99 + $5 shipping) or a Prana Box ($49.99 + $5). Then, once a month, a box shows up on your doorstep. You don’t know what will be in that box, only that it will be products ranging from Yoga accessories to organic foods, super food essentials to natural beauty items or herbal tonics & balms. You know that most of the products will be sourced from small local New Zealand companies – people pouring their passion into creating something that matters to them. It’s an awesome concept. And for a woman who doesn’t treat herself very often, $50/month is a small price to pay for a box of luxury to arrive hand-picked on my doorstep. It’s a gift to oneself, but it’s also a gift to Samanatha, the woman behind Prana Box, and all the other passionate people making the products featured. I hadn’t heard of any of the companies or products in my Prana box – it was all completely new to me. The first thing I noticed was the gorgeous smell that wafted up when I opened the box. It was sandalwood, coming from the travelling sandlewood candle. Now I travel a lot, especially in the summer, and I had never thought of getting a “travelling” candle. But it’s perfect! I resisted the urge to light it then and there, and instead, it’s going straight into my car, ready for the next trip. The second item I picked up was a muscle balm from Wellington Apothecary. I love giving massage, and of course, often have aching muscles myself. Especially in festival season when I dance up a storm for days! The muscle balm also smelled divine and I can’t wait to try it out on someone. Usually I use coconut oil for giving and receiving massage, but there is something wonderful about having a concoction that’s purpose-melded for aching muscles. 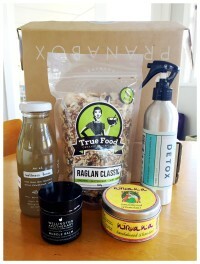 A wellness tonic from Ahi Ka was the third item in the box. Billed as a “modern take on the traditional Maori herbal tea” the tonic contains kawa kawa leaves, fresh from the bush on Great Barrier Island. Another New Zealand company I hadn’t heard of, creating it’s own magical blend of wellness. I’m cracking this one open as I write. It too smells delicious, and also potent. It’s not sweet at all, with a slight tang. Balancing out the drink is a paleo museli mix from True Food called Raglan Classic. Another item perfect for hitting up the festival circuit, and something I would likely never buy because of the price. Yet I know it’s amazing, and I will love eating it. Which may then help me to appreciate the value and search it out afterward! This is one of the benefits of getting a Prana Box – it’s an awesome way to be introduced to and try out new products. I can see myself falling in love with one or two of them and then tracking them down to re-order. For the products featured in the Prana Box, it’s a great form of… I was going to say marketing, but it’s more connection. Samanatha is acting as a conduit, researching and sourcing the best of the best and then getting those products into the hands of the consumer. It’s a great service to those small, passionate companies which often struggle to get on to supermarket shelves and into the consciousness of consumers in our crowded marketplace. Quick note – I’m halfway through the wellness tonic and I can feel active ingredients in my throat. It’s also got manuka honey in it, so that may be what’s giving me the tingling feeling. But there is a real sense of drinking not just a pleasant drink, but an actual tonic. That’s cool man! When I first opened my Prana Box, I wasn’t sure if I needed or wanted everything it contained. I could feel reservations about surrendering to receive whatever Samantha packed for me every month. However, I soon realised that because each item is so beautiful and luxurious, if I didn’t want or need something, it would make the perfect gift for someone. Nothing would ever go to waste, or end up sitting on a shelf gathering dust. The gift giving would continue! Plus, over-all, the value in the Prana Box was excellent. I know what some of those individual products cost, and it adds up to more than $49.99. The guaranteed value of the box each month is between $50 – $70, so you’re always getting more than you actually pay for. My box was the $49.99 version, the mini-box for $24.99 contains 3-4 products. This particular box was a courtesy box so I could write this review, however after receiving the Box and seeing what it’s all about, I want to get one every month! The only decision I have to make is whether to splurge $49.99 or go for the $24.99 version. Samantha is a yoga lover who by her own admission is very much a yoga newbie. She was looking for ways to improve her overall health and lifestyle, visiting organic food & beauty stores & trying to fit in as many yoga classes as she could while raising an active toddler. She started to wonder if there wasn’t a service out there that would deliver all these wonderful things to her door without her having to spend the time researching and finding them. 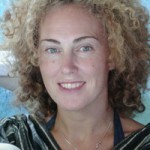 Now she’s passionate about discovering new “yoga-inspired” products to share them with the PranaBox community.